The Vikings play at Seattle Saturday. Kickoff is at 9 PM CST and the game will be broadcast on the NFL Network nationally and on KARE 11 TV locally. The radio broadcast is on KFAN-AM 1130/KTLK 100.3-FM locally with your usual crew of play-by-play guy Paul Allen, analyst Pete Bercich and sideline reporter Greg Coleman. Pre-game show starts at 7 PM CST. I’ll be watching mostly the same things on Saturday that I was watching for last week. Offense: For the first team offense I’ll want to see again how Donovan McNabb handles the offense and I’ll be looking to see how the line plays together and individually. And I’d like to see them score a touchdown or two. My main focus on the offense will, however, be on watching the receivers. We haven’t had a chance to see what Michael Jenkins can do and only saw a little of Kyle Rudolph. Visanthe Shiancoe will be held out again, so hopefully Rudolph will get more exposure. Percy Harvin and Greg Camarillo will also sit, so that will give us a chance to see some of the other guys battling for a roster spot. While Camarillo would seem pretty safe, it’s not a foregone conclusion that he’s already made the roster. Part of the equation is special teams play, and while Camarillo did handle the punt return duties last year competently, he didn’t exactly electrify either. The other receivers battling it out are Jaymar Johnson and Devin Aromashodu as well as former Bear Juaquin Iglesias, CFL transplant Emmanuel Arceneaux, rookie free agents Domonique Johnson and Andre Holmes and seventh-round pick Stephen Burton, who appears to have hands of stone. Johnson and Aromashodu saw action last week, with Jaymar returning a punt 40 yards and Aromashodu nearly coming down with an underthrown ball he had to reach up and over and seize the ball from the well-positioned defender. Both were impressive plays. 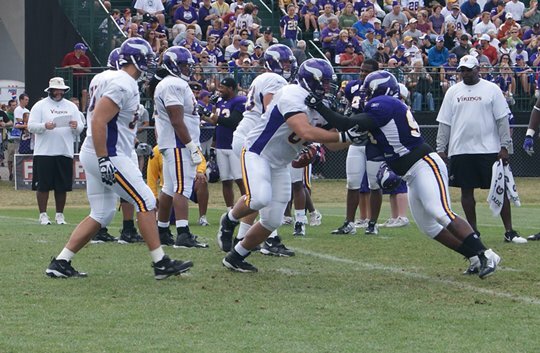 Finally, we’ll get a good extended look at Christian Ponder with the second team offense. Special Teams: Will Ryan Longwell consistently put kickoffs into or near the end zone? I’ll be watching the overall coverage but obviously the thing we’re most interested in on special teams is who will be our returners. I’m assuming Lorenzo Booker is the front runner for kickoff returner and at this point Jaymar Johnson has shown the most on punt returns. Will anyone else step it up? Defense: Linebackers Heath Fawell and Kenny Onatolu will sit this game and Asher Allen may as well due to a sore toe. But it looks like we may get to see our starting front four on the field at the same time, if only briefly. Rookie defensive tackle Christian Ballard had a nice sack last week and Everson Griffen had a nice game as well, so it will be interesting to see how they play. The Vikings also appear to be excited about seventh round defensive end D’Aundre Reed, so I’ll keep an eye out for him. Erin Henderson is the presumptive favorite for the weakside linebacker spot but the team may give backup middle linebacker Jasper Brinkley an opportunity to show what he can do there, as well. But the secondary is definitely where the action is on defense. Will we see Cedric Griffin back from his second ACL injury? If we do, it will likely not last very long but it will be nice to see how he looks. Will Chris Cook have another brutal game or will be bounce back? If Allen sits, we might get a good look at the wonderfully named rookie Mistral Raymond, who has made some plays in camp, one of which got him injured and caused him to miss last week’s game. I’d like to get an extended look at him and fellow rookie DB Brandon Burton. Finally, Tyrell Johnson gets the start at safety alongside Husain Abdullah. With Jamarca Sanford breathing down his neck, this may be Johnson’s last legitimate shot nailing down a starting spot. Opponent: With two well-known former Vikings on the opposite side of the ball Saturday night, it will be fascinating to see how the Tarvaris Jackson–Sidney Rice combo fares. I caught a bit of Jackson’s performance last week (Rice didn’t play). On a play-action pass play designed to go to a running back leaking out into the flat, Jackson executed the play-action, settled into the pocket, looked the safeties off downfield and then tossed the ball to his running back, who was open in the flat. Instead of getting the ball out to his receiver quickly in order to give the back time to turn upfield and make a play, Jackson lofted the ball to him, giving defenders time to make up ground and tackle the back for a short gain.